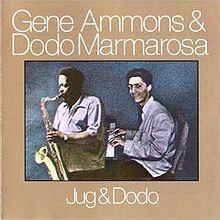 The Song Is You, which is one of many tunes that were written by the famous composer Jerome Kern, was recorded by Dodo Marmarosa (piano) in 1962 on the album Jug & Dodo. It is a good example of Marmarosa’s excellent improvisation using block chords (Shearing’s locked hands style), although it was sadly one of Dodo Marmarosa’s last recordings. In this recording, Ammons (saxophone) does not play, but Sam Jones (bass) and Marshall Thompson (drums) do. Enjoy!